The basic dimensions of a 50ft ACC catamaran are: LOA 49ft 3in; Beam 27ft 9in; Wing Height 77ft; Crew 6; Wing Area 1,100 ft2; Weight 5,300lb. Hulls: Hull parameters are strictly controlled, and the hulls are therefore almost identical in appearance across the fleet. They will likely not be spending much time in the water anyway! Headsails: All built by North Sails, they are identical across the fleet. There are three sizes to choose from, depending on the conditions. Fairings: Operating in 50-plus knots of apparent wind makes windage a big deal. Wingsail: The basic dimensions of the wings are set by the ACC rule, and the consist of a solid forward “element” with trailing elements divided into three independent sections, like the flaps on an airplan wing. The key will be the control systems employed to control these different elements during maneuvers and fine-tune camber and twist. T-rudders: The other key component of the lifting equation: like the daggerboards, they are canted to adjust the angle of attack of the winglets, which are fixed on the vertical portion. Wheel: The wheels include sets of buttons that are used to cant the daggerboards and rudders, thereby adjusting the amount of lift being generated. Much of an ACC catamaran is virtually one-design in the interest of keeping costs down, including the wing design parameters and basic hull(s) forms. Even the soft headsails, made by North Sails, are standardized across the fleet. Nonetheless, considerable design freedom remains in what are considered the greatest performance-enhancing components of the boats: the hydrofoils that lift the boats clear of the sea; the interior mechanical components that allow trimmers to adjust a wing’s camber, twist and angle of attack; and the hydraulic systems that make it possible to execute these all-important adjustments. In recent months, each team has been using a “turbo” version of its foiling AC45s to test out various different components, and the results of these tests, often between competing teams on the actual Cup course in Bermuda, have led to the final configuration of the new ACC boats that began launching in February. The only team without a 100 percent brand-new boat is Groupama Team France. However, while budgetary limitations may have forced the French to pick and choose where to put their design energy, re-using parts from its turbo AC45 hasn’t prevented them from taking a fresh look at the especially important bits. “The one-design parts are seen in the IGES files shared with all the competitors,” says Nat Shaver, a foil designer for the French team, referring to the data distributed among all the teams in an effort to help the new campaigns get up to speed. However, he emphasizes he still has plenty of room in which to innovate, including in the systems that cant, or rake, the daggerboards and rudders fore and aft to adjust the angle of attack of their horizontal/lifting portions, and the daggerboards and rudders themselves. With respect to the latter, Shaver says, he and other designers are focusing especially closely on 1) stability, as determined by how open the tip angle is between the shaft (vertical) and the tip (horizontal) portions of the daggerboards; and 2) cavitation properties (aeration or spin-out) as related to super small foils and the ability of crews to control them. In short, he says, skinny open foils may be faster and lower-drag, but the precision steering and trimming required to make them work is nearly impossible in the real world. 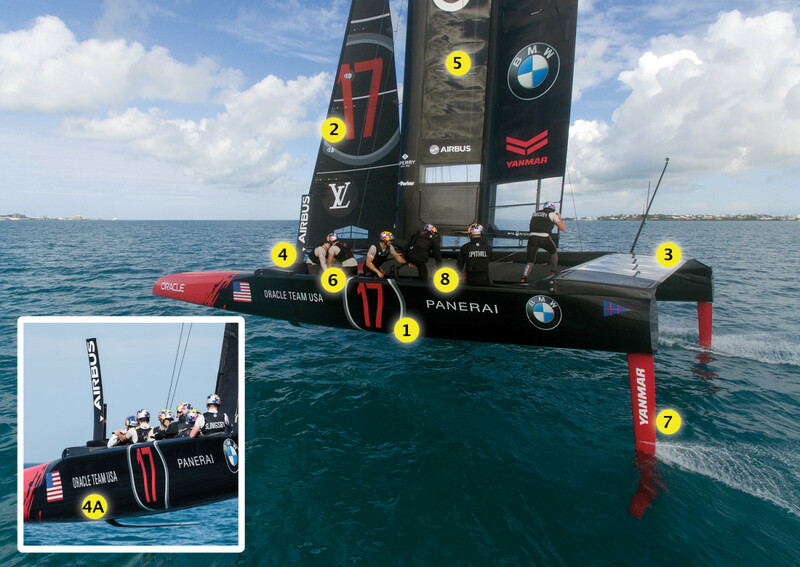 In all, the teams are allowed four daggerboards or two pairs. They are also allowed to change the tip (which represents 30 percent of the weight of the board) six times per board. At press time the general consensus appeared to be that a roughly L-shaped daggerboard configuration was the best; although some teams, including ETNZ, were also incorporating subtle compound/angled configurations into the lifting portions of their boards. Beyond that, the coolest—and geekiest—part of a Cup boat is the systems the teams are using to quickly adjust the foils and sails during maneuvers. These systems, in turn, revolve around the hydraulic “accumulators” each team must design: basically pressurized boxes of hydraulic fluid that are powered by human grinders spinning handles or, in New Zealand’s case, bicycle pedals. Though the volume of these accumulators is limited by the rules, the designs of the rams and the distribution and gearing of the hydraulic pressure systems are all left up to the individual teams—and are among the most closely guarded secrets of this Cup cycle. Of course, he who holds the wheel of an ACC catamaran has a great deal of control over the outcome as well, and it would be hard to imagine a more responsive or interactive sailboat than a modern ACC catamaran. Still, Shaver and other designers believe that it is the intersection of human power, efficient hydraulic systems and foil design that will be the key to winning the Cup because they are all so closely related.